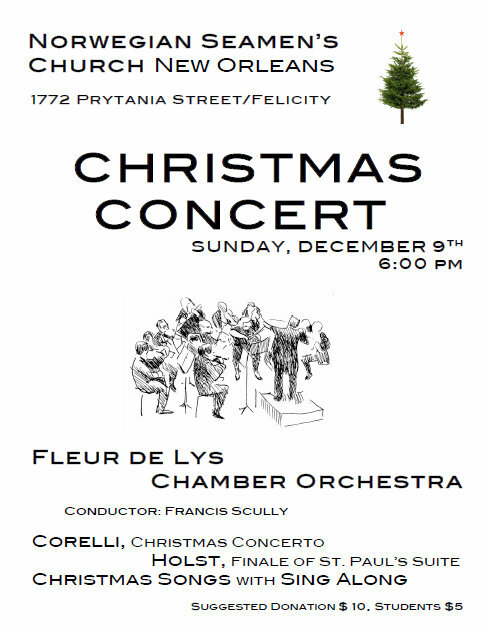 The Fleur de Lys Chamber Orchestra will hold its inaugural Christmas concert featuring works by Corelli, Bach and Holst and traditional carols on at 6 p.m. Sunday (Dec. 9) at the Norwegian Seaman’s Church at 1772 Prytania Street. The Fleur de Lys Chamber Orchestra is proud to announce its inaugural season! Founded in the fall of 2012, the ensemble is excited to bring a wide variety of string orchestra music to New Orleans’ audiences. It is comprised of top amateur and professional musicians from around the world. The musicians’ backgrounds couldn’t be more diverse: the group includes students and graduates of musical performance from Loyola, music teachers, an LPO violist, and people who have talents in other areas, such as medicine, art, education, and law, just to name a few. All musicians are passionate about exploring classical music together and have played their instrument from early childhood. They have performed with a multitude of orchestras and chamber ensembles in the New Orleans area, including the New Orleans Civic Symphony, Tulane University, and Loyola University orchestras. 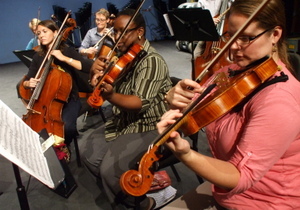 The Fleur de Lys Chamber Orchestra promotes the excellence of music through string orchestra, and is committed to providing high quality performances to the New Orleans Area. The first performance took place on the occasion of the annual Scandinavian Festival on the first weekend of November. The concert program included pieces by Scandinavian composers for string ensembles. It was a great success! The ensemble is currently planning future public performances, such as a collaboration with Encore Academy, a local fine arts charter school, as well as a Christmas concert at the Norwegian Seamen’s Church. Rehearsals for the next major project will start in January under the direction of Francis Scully.